Fixed on top of Cape Canaveral’s Complex 40 launch pad without its payload, the Falcon 9 completed a customary pre-flight “static fire” test Wednesday night. The multi-hour exercise began with the 600-foot (nearly 200-meter) rollout of the two-stage rocket from SpaceX’s hangar, then the launcher rotated vertical to receive its load of liquid propellants. 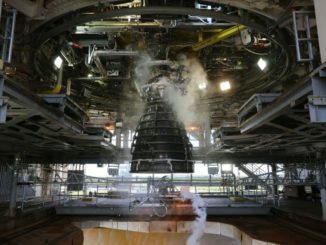 In the mock countdown’s final minutes, control computers sent commands to pressurize the Falcon 9’s propellant tanks, then ignited the rocket’s nine Merlin 1D engines for a few seconds while the vehicle stayed grounded. 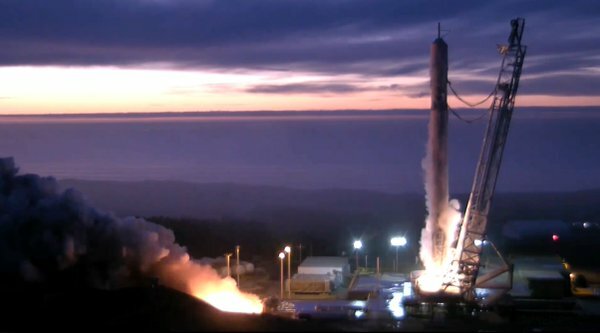 SpaceX engineers planned to review data from the static fire test before issuing a “go” for final launch preps during a launch readiness review. Once ground crews attach the JCSAT 16 communications satellite to the Falcon 9 upper stage, the rocket will emerge from SpaceX’s hangar again Saturday for the final countdown. Liftoff of the 23-story-tall Falcon 9 is scheduled for 1:26 a.m. EDT (0526 GMT) Sunday at the opening of a two-hour launch window. The rocket will deploy the JCSAT 16 telecom payload into a “supersynchronous” transfer orbit, putting the satellite on course to reach a final operating post nearly 22,300 miles (35,800 kilometers) above the equator. At that altitude, JCSAT 16’s motion through space will exactly match the rate of Earth’s rotation, allowing the satellite to remain over the same spot of the planet. 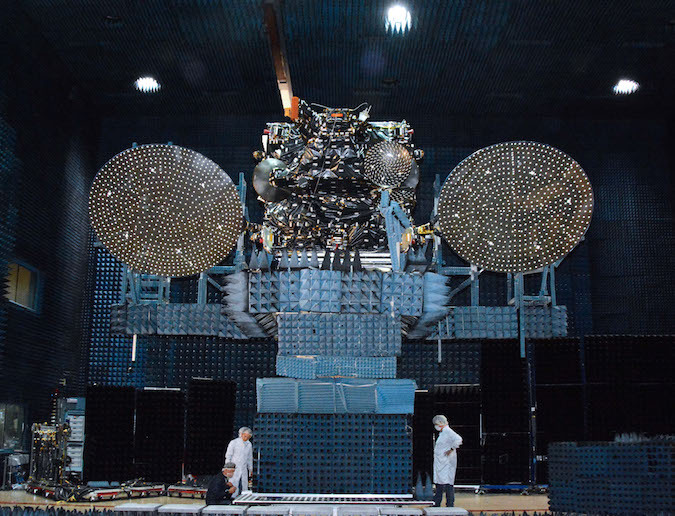 Made by Space Systems/Loral of Palo Alto, California, JCSAT 16 will become a spare satellite for SKY Perfect JSAT Corp., a Tokyo-based company which provides broadcast relay capacity over the Asia-Pacific. 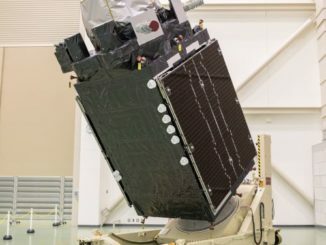 JCSAT 16 is the second Space Systems/Loral-built satellite SpaceX will launch for SKY Perfect JSAT this year, coming after the May 6 blastoff of the company’s JCSAT 14 telecom station. This weekend’s flight will mark the eighth Falcon 9 launch of the year, and the 28th Falcon 9 mission overall since the rocket debuted in June 2010. JCSAT 16 carries Ku-band and Ka-band communications transponders and antennas to provide backup capabilities in video distribution and data transfer markets. The new satellite is tentatively assigned to a slot in geostationary orbit at 162 degrees east longitude, where it will back up the aging Superbird B2 satellite, which launched in 2000 aboard an Ariane 4 rocket. But JCSAT 16 can move into another position if needed. “When launched, JCSAT 16 will provide us with the flexibility to reinforce our growing fleet as needed, ensuring the highest level of reliability for our customers,” said Shinji Takada, representative director, president and CEO of SKY Perfect JSAT. Forecasters from the U.S. Air Force’s 45th Weather Squadron predict favorable weather for the Falcon 9’s middle-of-the-night launch opportunity. There is an 80 percent chance of acceptable conditions in the Air Force’s official launch weather outlook. Forecasters call for a few clouds at 2,500 feet and scattered clouds at 15,000 feet, south-southeast winds of 10 to 15 mph, and a launch time temperature of 78 degrees Fahrenheit. Like all of SpaceX’s recent missions, the Falcon 9 rocket’s first stage will aim for a propulsive landing after detaching from the rocket’s second stage about two-and-a-half minutes into the flight. The high-speed trajectory required on Sunday’s launch to put JCSAT 16 into orbit thousands of miles above Earth means the Falcon 9 booster will head for touchdown on SpaceX’s recovery ship in the Atlantic Ocean about nine minutes after blastoff. The landing maneuver is part of SpaceX’s initiative to recover and reuse rocket boosters, an achievement the company says will cut the cost of launch services. SpaceX has recovered five Falcon 9 boosters on 10 attempts to land the rocket at sea or back at Cape Canaveral. 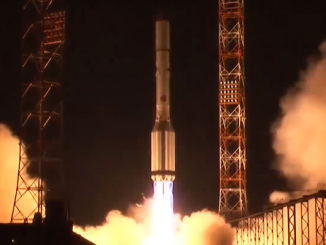 One of the previously-flown rockets is supposed to fly again later this year on another satellite deployment mission. Officials have not announced which mission will be the first to fly with a used Falcon 9 first stage.